Originally the idea was to grow medicinal plants so they could be studied, classified and experimented so as to define their therapeutic properties. With this in mind, the French navy created botanical gardens in its ports and near its hospitals, which also contributed to the establishment of fruitful contacts with the gardens set up in the colonies, in India, on the Isles of France and of Bourbon (Mauritius and Reunion islands), in Senegal, in French Guyana or Martinique. It also took botanists of the 19th century on board during the great explorations, in charge of searching for, collecting and bringing back new plant species for the Muséum d'Histoire naturelle. Besides the training given in botany and its medical applications in schools of surgery in the naval hospitals, the botanical gardens in the ports were subsequently to serve as acclimatization relays for the exotic plants brought back alive from great sea expeditions. The botanical gardens of Rochefort, Brest, Toulon and Lorient were thus created after Father Plumier discovered the Begonia, named after his protector Quartermaster Michel Bégon, in the Caribbean islands. A first naval botanical garden was created in 1697 by Marc-Antoine Gallot, who had been physician-in-chief of the port since 1695, on the instructions of Quartermaster Michel Bégon (1838-1710) who wished to look after "curious, useful and pleasant plants" and send them to the Jardin des Plantes in Paris. However, this garden located at the time within the walls of the first hospital, known as the "hôpital Charente" which opened in 1683, was not to survive the quartermaster who died in 1710. It was not until 1738 that physician-in-chief Jean Cochon-Dupuy (1674-1757), founder of the School of Surgery in Rochefort in 1722, obtained permission from the minister to develop a new botanical garden which was set up at the end of the place des Fonderies. Inaugurated on 30 December 1741, it preceded those of Brest and Toulon. As it happened, from the beginning of 18th century, Rochefort had become the main port of arrival for exotic plants, particularly from the American colonies. In 1797, three breadfruit tree plants (artocarpus altilis) from the d'Entrecasteaux expedition were to be seen there. The management of this new botanical garden was immediately entrusted to Gaspard Cochon-Dupuy (1710-1788), deputy port physician at the time, who classified them according to their medicinal properties. Following the Règlement of 1768, the physician-in-chief's mission was to define usual plants with the way they were used and also present the different drugs by showing their properties and indications in both internal and external diseases. Demonstrations of plants were carried out according to the classifications in force. 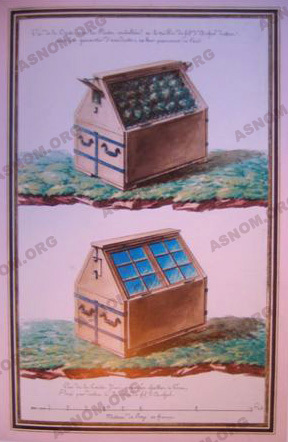 After Gaspard Cochon-Dupuy, plants were classified according to the Tournefort method by Poché-Lafond in 1793 and subsequently according to the Linné method by Bobe-Moreau in 1798 before being sorted according to the natural Jussieu method by Repey in 1827. 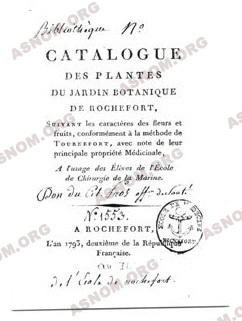 Catalogues supplying the inventory of Rochefort plants were sent on several occasions to the Muséum. This botanical garden rapidly became too small. As early as 1817 it already had around 2,000 plants including 1,500 exotic plants. However it was not actually extended until 1827 with the integration of a contiguous higher-up and better-oriented plot of land, known as the jardin du duc de Bordeaux. This extension increased the surface area of the garden fourfold, and this was its heyday. Ten years later, in 1837, the naturalist R.-P. Lesson stated that it was the third largest in France with close to 4,000 plants. Built like an auditorium, it had four pools filled with aquatic plants and had hot-houses for the exotic species, temperate greenhouses, greenhouses for succulents and cacti and an orangery. At the time, you could see plants such as the clove tree, the cinnamon tree, sugar cane, the cotton plant, the date palm, the pineapple plant and even the breadfruit tree but, despite some improvements during the second half of 19th century, and with the end of the great voyages of discovery, the activity of the botanical gardens declined progressively and it was abandoned by the navy in 1896. In Brest, when the hospital was founded in 1694 under the management of the physician-in-chief Ollivier, a medicinal herb garden had been created behind the church of Saint-Louis which was set out in three terraces parallel to the Penfeld river, above the Corderie neuve. This garden was completed in 1698 and boasted around a hundred medicinal plants for the hospital's apothecary at the time. It underwent considerable development after the foundation of the School of Surgery in 1731 by the naval minister but its expansion was hampered in 1736 by the partial collapse of the terraces built in 1694. However, everything had returned to normal by 1738. In 1757-1758, on returning from Louisiana, Dubois de Lamotte's squadron brought back the great typhus epidemic which killed 5,000 people in Brest. The garden could not totally meet the enormous needs of the time, and its management was entrusted to the frères de la Charité in January 1759. Unfortunately, the results obtained by the brothers were catastrophic and the indispensable therapeutic plants had to be purchased elsewhere. In November 1763, Pierre Poissonnier (1720-1798) had just been appointed General Health Inspector for the naval hospitals and ports, and physician-in-chief Chardon de Courcelles (1705-1775) requested another botanical garden as the previous one had become too small following its collapse. However it was not until 1768 that he was granted a plot of land nearby which was to make up the first terrace of the new garden. Nevertheless, when in 1772 the gardener-botanist Antoine Laurent (1744-1820) arrived at the Jardin des Plantes to manage the garden, it only contained two hundred native plants. By multiplying the cultivation of local and foreign plants, Laurent finally succeeded in assembling a collection of over 2,000 species of interest and established a particularly rich herbarium. It is therefore thanks to the skill and determination of this unequalled botanist that this naval botanical garden was to meet with such fame that it was to be considered as one of the wonders of Brittany. In 1816, neighbouring plots of land were acquired and this extension was to enable the development of two higher terraces, while two greenhouses, one hot and the other temperate, made it possible to cultivate a variety of plants. A medicinal garden had been created in Toulon in 1769 on market garden land rented from the hôpital de la Charité in the quarter of Saint-Roch but it was not until 1786 that a real botanical garden was to be developed on a plot of land belonging to the Administration of the town's Hospices. It was managed by the physician Barberet (1714-1794), a graduate of l'Ecole de Montpellier, assisted by the botanist gardener François J.-B. Martin. Martin wrote a report on the botanical garden of Toulon in 1791 and a Catalogue des plantes of Toulon. The garden housed traditional plants alongside the exotic plants introduced between 1787 and 1792. Later it was to be enriched on the return of sea voyages such as that of l'Ariège in 1808 and above all that of la Coquille in 1825. After the death of François Martin in 1817, the garden was managed by Gaspard Nicolas Robert (1776-1857). Assistant botanist gardener in April 1794 and botanist gardener in 1801, he left for Paris to study natural science before being posted to Corsica in 1802 to manage the newly created garden there. On his return to Toulon, he was to second the elderly botanist Martin handicapped by his age and succeeded him on his death as port botanist in June 1817 at the same time as promoted to chemist. Robert was held in the esteem of the great botanists of the capital to such an extent that one of them named a new plant Robertia. He kept up correspondence with the Muséum and published in 1821 a Catalogue des plantes cultivées au jardin botanique de la marine du port de Toulon. Robert was the first in France to grow the loquat (Eriobotrya japonica). This was a model garden for the rarity and beauty of the specimens exhibited, and it was much admired by Gustave Flaubert. On reaching retirement in November 1847, Robert was replaced by the botanist gardener-in-chief Philippe. However, in 1849 the administration des hospices de Toulon, wishing to increase the size of the l'hôpital de la Charité, stated its intention of taking back the plot of land occupied by the naval botanical garden. In spite of the fact that the commission named by the Académie des sciences refused, disputing the validity of the project, it was no use. The garden was vacated on 1 January 1850 and transferred to the hôpital de Saint-Mandrier, on the other side of the Toulon roadstead. Big trees were transported with all their roots and soil but many plants did not survive this transplantation. The new garden was divided into six squares. The four squares the furthest to the south were occupied by the botanical school plantations, the fifth was an English garden with palm-trees and the sixth was to receive the plants from the greenhouses during the summer. Unfortunately the garden had a serious drawback in that it was exposed to the mistral wind and also that it was in Saint-Mandrier near a secondary hospital which had only been used intermittently from 1850 to 1858, during epidemics or military operations. Lastly, the harsh winter of 1870-1871 caused considerable damage to the garden which gradually declined and practically disappeared from 1884. A herb garden was created as early as 1724 in Lorient by the Compagnie des Indes near its small hospital in the town centre founded in the same year and which operated up until 1766. The royal botanical garden, within the second wall of the arsenal, was managed by the naval physician François Galloys (1719-1779) who explained the layout of the garden, which already had a hothouse, in a dissertation in 1773. In 1777 in a letter to the minister, he boasted of the "real advantage of procuring treasures of trees and plants from India and China for France and America". Galloys exchanged a considerable number of plants with the colonies, particularly in India and the Caribbean. He received a stipend of 1,200 livres a year to maintain the hothouse which housed exotic plants for the Jardin du roi in Paris. He also maintained regular correspondence with the king. Apart from their fundamental vocation of growing and studying plants for treating diseases and teaching medical pupils in naval hospitals their properties and therapeutic virtues, the botanical gardens in the ports became a relay for live plants brought back from exotic countries during the great sea expeditions of 19th century. It was in these gardens that they were acclimatized before being transferred to the Muséum d'Histoire naturelle (the new name given to the Jardin des Plantes in 1793) but also were the pride and glory of the port gardens in the exceptional experience they afforded their botanists. In any case, they greatly contributed to the influence of the French navy and its Health Service. Michel Bégon (1638-1710), a naval quartermaster, a renowned curious mind and friend of scientists and travellers, was a true humanist. He was interested in everything, including the study of plants. He was the instigator of the French navy's first botanical garden created in Rochefort in 1697 within the walls of the l'hôpital "Charente" and opened in 1683. For this reason, he can be considered to be the father of botany in this port. From a family of lawyers, he was Quartermaster of the Leeward Islands (1682-1684) and Marseille Intendant of the Galleys (1685) before being appointed on 1st September 1688 Quartermaster of Rochefort, a function he was to fulfil (with the intendancy de la Généralité of La Rochelle from 1694) up until his death in 1710. Whilst he was Marseille Intendant of the Galleys, Bégon was ordered by the king to find a naturalist charged with exploring the Caribbean to bring back "rare plants which are also useful to medicine". He contacted a Marseilles physician, Joseph-Donat Surian, who asked a religious cleric and renowned botanist, father Plumier, to accompany him in this great adventure. Father Charles Plumier (1646-1704), of the Minimes order, had studied botany during a recent stay in a monastery in Rome and subsequently, while he was in the convent of Bormes, had collected plants in Provence and in the South of France with Pierre-Joseph Garidel (1658-1737) and Joseph Pitton de Tournefort (1656-1708). Charles Plumier subsequently made a number of trips to the islands of America without ever actually reaching the great continent. The first trip, made with avec J.-D. Surian in 1689, took him to Martinique, Haiti, the islands of Saint-Vincent, Saint Christophe, etc. He discovered a number of new species and being a fine draftsman, drew countless, superb illustrations. He then discovered six little herbaceous plants with thick somewhat round leaves to which he gave the name Begonia as homage to the quartermaster of Rochefort who had helped further his voyage. Tournefort in a book Institutiones rei herbariae (1700) listed the six species of Begonia de Plumier (Begonia purpurea, Begonia nivea and four Begonia roseo flore) and gave their figurative representation. The Begonia genus was also mentioned by Linné in Species Plantarum (1753). Appointed royal botanist on his return to France in 1690, Plumier left on a second voyage at the end of which he published in 1693 his famous Description des plantes de l'Amérique. In 1696 his third trip was to take him to Guadeloupe, Martinique and Santo Domingo. In Nova plantarum americanarum genera (1703-1704), he described 106 new genera including Vanilla and 219 new species (including the 6 species of Begonia) with forty extremely precise illustrations. This established him as the founder of the American system of classification. The fourth voyage was instigated by Fagon, the royal physician, to study cinchona trees in Peru and was to be his last. Father Plumier died on 16 November 1704 in Sainte-Marie near Cadiz where he was due to embark for South America. His Traité des Fougères de l'Amérique was published posthumously (1705). This specialist of 17th century Caribbean flora left a considerable legacy of manuscripts and a collection of 6,000 drawings including 4,000 of plants. Universally respected by his contemporaries, scientists such as Tournefort and Linné dedicated the Plumeria genus of the Apocynaceae family to him. Michel Bégon was a benefactor for Rochefort. It is said that he found the growing town 'made of wood and that he left it in stone'. He also did a great deal for hygiene by recommending that the houses and the paving of the streets be raised. He concerned himself with the well-being of the inhabitants, and health questions and founded the an establishment for orphans of navy men in 1694 when in the same year the port was struck by a terrible epidemic. In 1704, he brought to Rochefort the physician Jean Cochon-Dupuy who practiced his art in La Rochelle, and who founded the School of Surgery in 1722. An avid collector, Begon built up a famous Cabinet of curiosities whose inventory of 1 June 1699 revealed an immense wealth (a library containing 7,000 books, manuscripts, representations of plants, paintings and portraits, a fabulous collection of etchings, maps, plans and drawings of towns and ships, innumerable medals and coins and a variety of precious objects). All that remains of this fabulous collection is a set of 25,000 etchings preserved in the Bibliothèque Nationale. He also left a hand-written diary of his Voyage en Amérique. A truely honest man of 17th century, Michel Bégon was without a doubt one of the greatest administrative officers of his time. Mourned by all, he died on 14 March 1710 in Rochefort and was buried in the church of Saint-Louis. The conservatory commemorates the famous quartermaster who gave his name to the flower discovered by father Plumier in 17th century. In 1986, to celebrate the memory of the great man, the town acquired one of the most beautiful collections of Begonias in France, threatened at the time with extinction. It belonged to a horticulturer in the Val d'Oise, Vincent Millerioux, who had accumulated around 200 botanic and hybrid Begonias (hybrids are crosses, mutations, selections and genetic deviations). This Millerioux collection was then installed in 1988 in a 650 m2 greenhouse in the horticultural town centre, erected as a municipal museum in 1990. The greenhouse was extended by 350 m2 in 1993 while the Conservatory was extended with a new 100 m2 museographic area in 2010. Today, the Begonia Conservatory, an approved National Collection, is one of the biggest collections of Begonias in the world. This greenhouse Conservatory (an overall 1 100 m2) – which makes Rochefort the 'Begonia capital' - houses over 1,500 botanical and hybrid Begonias (500 botanic and 1,000 hybrids and the plants are cared for, grown and propagated there. The collection increases regularly by exchanges with French or foreign collections or directly from their original tropical forests. La Serre Conservatoire de Rochefort, an exceptional display of tropical ecology, houses not only traditional Begonias but also unknown or forgotten plants. It is here that every year new Begonias are created at the price of important research work. The Begonia genus – one of the genera of the Begoniaceae family but by no means the only one – now includes over 2,200 botanical Begonias in the world and close to 13,000 hybrid species (obtained since 1845). This Begonia conservatory is also a return to grass roots and is a reminder of the prestigious past of Rochefort, which in some respects ensures its continuity.